The following is an interview with Tree, founder and director of the Free Farm Farm and the Free Farm Stand, two San Francisco based urban agricultural projects. These projects really speak to a part of the ‘unseen’ history of San Francisco we have been exploring throughout this course. In an age of vacant lots and an ever increasing crisis of affordability The Free Farm gives out seedlings and starts and teaches people how to grow food wherever they can; in boxes, containers and window-sills. In a time of ‘food deserts’ poor nutrition and so-called food scarcity the Free Farm gives away an abundance of fresh organic local fruits and vegetables. These efforts to democratise access to healthy food are crucial to the longevity of our cities and ourselves yet they are repeatedly shut down, overlooked and ultimately made to be forgotten. This interview gives a flavor of the vision of people like Tree working to counter this invisibility. He offers tools for seeing and importantly for imagining the possibilities for change that start with the reclaiming of vacant spaces and the sprinkling of seeds. Tree at the Free Farm Stand, 2010. Would you like to introduce yourself and talk a little about your projects? My name is Tree and I run a couple of non-profit projects called the Free Farm and The Free Farm Stand in San Francisco. The Free Farm is...well that's the thing. What are things about? ‘Things’ are sound bites. That’s what everybody is used to in the media. Like ‘growing food’ and ‘giving it away’ are soundbites. But there is so much complexity to what we are doing. There are a lot of layers. We try to see things in a more holistic way. Science has become very compartmentalized. We would like to go back to what science used to be almost like a philosophy or something. There is a lot of other things going on besides the immediacy of growing food. We are trying to repair the world! We are trying to do our best to make things more compassionate and beautiful. The way we do that is through our work and this work has a lot of connections. We are building community and a habitat for pollinators to come in. We are creating soil to replace soil that is constantly being destroyed in the US. We are teaching people the value of eating a plant based diet versus an animal based one. We’re trying to make the world more just in the sense that everybody has access to healthy organic food. We are trying to bring people together on a weekly basis at the Free Farm Stand and help neighbors get to know each other and share their passions with each other. We are trying to inspire people, to give people hope because its a very unhopeful time right now. 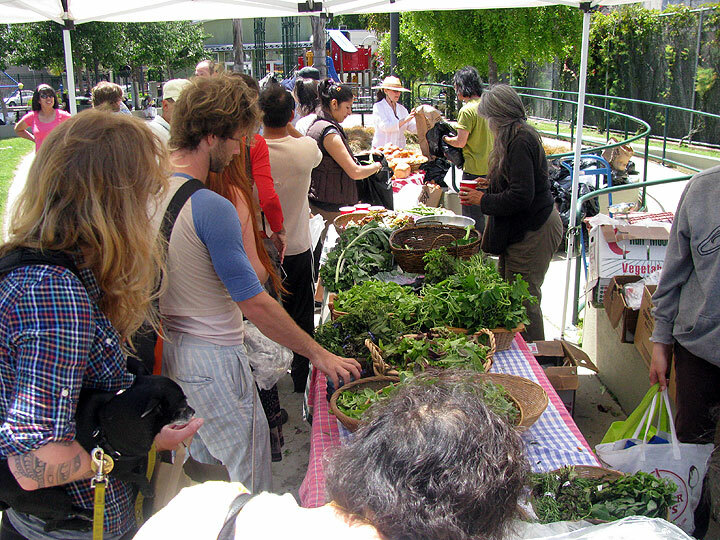 Free Farm Stand, Treat and 23rd Streets, 2010. Do you want to speak about how you came into being. Where and what did you emerged out of? What was your inspiration was for planting here in downtown San Francisco? 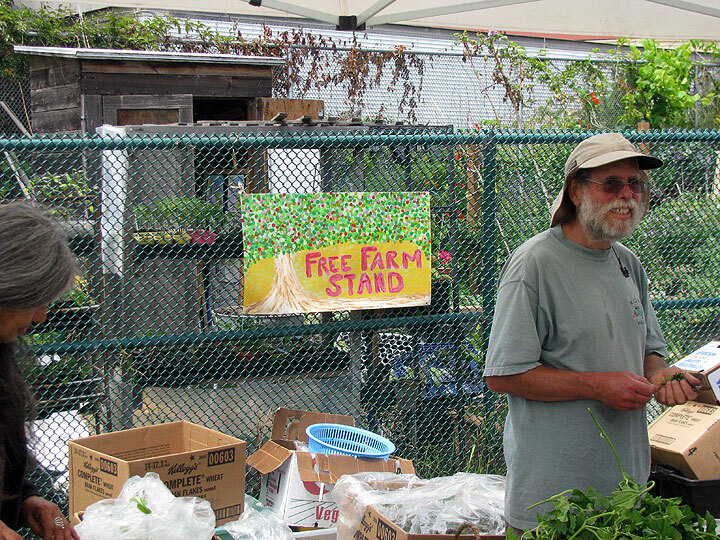 This farm started in 2010 during which I was actually running a Free Farm Stand in the Mission. Now we are in the Western Addition. With a farm stand you usually think of having a farm and then having a farm stand but we didn't have a farm. 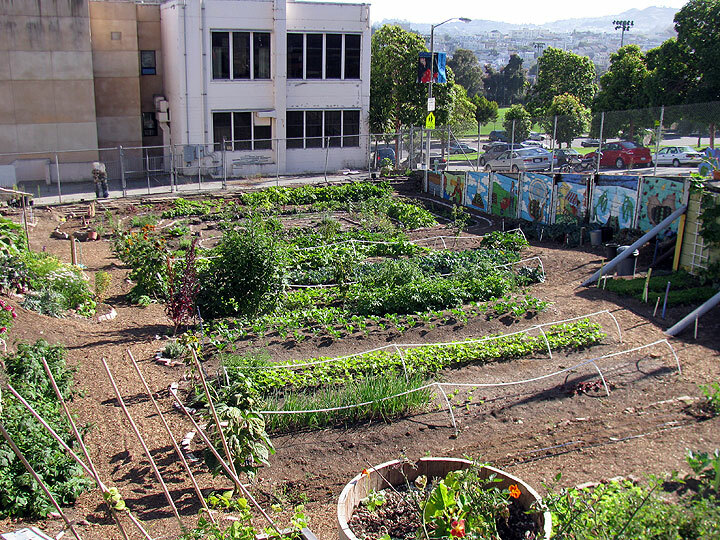 We were growing food in a lot of different gardens in the Mission that we helped start in people’s backyards. In 2008 when I started the Free Farm Stand there was quite a lot of excitement being generated about growing food locally and eating local. Michael Pollan had these books out and everybody was getting excited about urban agriculture. I was certainly influenced by that too but I had been growing food for a long time. My angle on it was to make sure poor people weren't left out of the process or this new movement that it wasn't just slow food for rich people that could afford it. All this love of farmers markets and stuff like that. I wanted to make sure everybody could be included especially people that were struggling to make ends meet. So I was running this farm stand and growing food and trying to get my neighbors to grow food. One of the volunteers that worked with me told me about this half acre empty lot that some people from her Church were trying to turn into a garden. Pastor Megan came to my farm stand and asked for help. I went to check it out and it was pretty amazing with a lot of space. So we started this farm with some other non-profits in 2010. Can you tell us a bit about what's growing here? We grow a lot of annual crops; kale, lettuce, zucchini, cucumber, beets, carrots, radish. We also have an extensive collections of fruit trees like olive and kiwi. Its been a fun experience because the land is very unique it’s set below the sidewalk so it traps warm air. We have an amazing avocado tree that’s loaded with avocados! We also have a lot of perennial plants, some rare and uncommon perennials. One important thing we are trying to do is inspire people to grow food and teach people about different possibilities so we like to have a lot of diversity and have pollinator plants to attract bees and hummingbirds. We have a hot house where we grow things like eggplant and hot peppers. We play around with growing things that like a lot of heat. Free Farm at Eddy and Gough, 2010. This is all to be giving away for free at the farm stand? We actually have two farm stands. One is at this farm on Saturdays where local neighbors come and get produce that we grow here and then there is a larger one in the Mission where we collect surplus organic and locally grown produce from other farmers markets to give away for free. You were saying you use the space to educate people about the possibilities and benefit of growing your own food. How do you run the educational aspects of the project? What is the role of education in creating change? For anybody that comes here we will teach them by doing. We don't have formal workshops but our method is always to teach by doing. By doing it with your own hands. We have also set up a exemplary container garden at the entrance to the farm.We want to show people that you can grow a lot of food in containers right up by the front gate so people walking by can see. We also just got a small grant from a pollination project that has given us some money to set up an educational booth at The Free Farm Stand in the Mission. We are going to offer more educational materials and have a booth where people can come and ask us questions in Spanish and English. We also love to give out seedlings. We have a giant greenhouse and we grow seedlings and give them to people. You’ve been at this a long time. How have you experienced the changes in neighborhoods and the city? 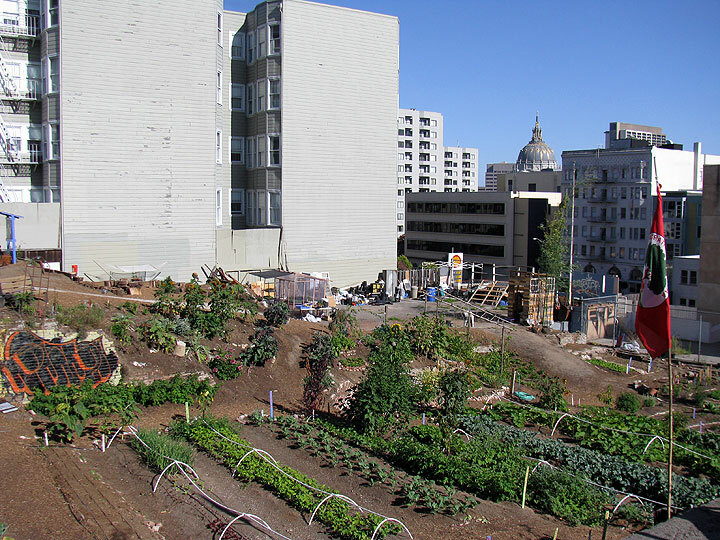 How has this affected your work within the urban agricultural movement? Well the changes that are going on in San Francisco right now are very dramatic. I feel like the city is basically under attack by developers and people with money. You might also say that open space is under attack, not just gardening projects but any open space. Any land that is vacant is immediately built upon. This is very short sighted. Land is getting gobbled up, buildings are getting gobbled up, people in rent controlled apartments are being evicted. Its becoming more and more a crisis of affordability and everybody recognizes it but nobody does anything about it. Well very little. There is progress being made on one level, like for example, we just formed an urban agriculture department in the city. What are they really going to be able to do? There is no funding. The funding they do have is going to go to the salary of some highly paid executive. You can only do so much if you don't have open space. There are rooftops but I don't think rooftops are as valuable as open spaces where people can wander in and get away from the city. This is very important. People don't wander into rooftops gardens. We need to pay attention to all sentient beings we can't live in a closed vacuum. You need to have the birds, the trees, the bees, the moths, the raccoons. All these things make the city livable. But people have a blindness to this need. That what's going on. The city is becoming a meaner place. Free Farm at Eddy and Gough, 2010, looking southwest. So what do you see as the role of places like The Free Farm in this sort of “mean” culture we live in which open spaces are in constant threat of corporate development? Well places like this are the answer. But city officials and those with power have a blindness to its inherent value. We have to keep struggling where we can. Keep doing what we can do to maintain open space and fight for people's right to live here. We are promoting the idea of sharing and seeing ourselves as a family to move away from capitalist models. We need to develop a model built on trust and compassion rooted in centering ourselves and spending time in nature. We need to spend some time in receptive silence, in helping others. That the only way we are going to change. Political actions like non-violent civil disobedience might help in certain situations. The Occupy movement certainly woke people up. But the only way we are going to change is if we actually do the work. Create the change in the here and now. We need to show people that this model of funky non-profit all-volunteer generosity works. Well sort of works. The private property problem is endemic to our society. People have the right to keep vacant lots and not use them. Corporations have the right to own buildings and let them sit vacant for years. We are trying the reclaim these vacant spaces. What's happening with this space now? You said it is being dispersed and replanted throughout the city. The church that owns this land has for the most part been very supportive of us and has let us be here for 3 years without paying any rent. They have paid the water and have supported our work which aligns with their beliefs in serving the poor. But they have a blindness too. They were offered $5 million to sell the land to a developer. They are going to clear it all out and build what they call ‘affordable housing’ here. This is very short-sighted. Who knows. They think they can do a lot with $5 million. We have to leave in 2 more months. We are scrambling to find homes for all the plants and to replant the farm and spread it out among other groups that are doing similar work. So it continues in different forms? Spreading seeds throughout the city. Yeah it's kind of like what Hayes Valley Farm did... by the way that's another example of hypocrisy in this city. They say they are a green city that supports agriculture but all these large projects that have been doing so much good for the city are consistently being closed down. There is no real support from the city to help us. I don't expect help because like I said both the problem and the solution lies in ourselves. We need to grow together and learn to be more compassionate and caring and share common spaces. How best to illustrate the multitude of possibilities for vacant urban spaces? Is there a symbolic resonance to the image of the urban garden? What are the long-term transformative potentials here? I've always believed that the best way to bring about change is by example. We have created a successful experiment here. We have kept records. We know we've grown over 10,000 pounds of food over the last 3 years. I don't really trust media to get the story right but if there was some media that showed what’s going on here I know we would get people inspired. People actually are inspired all over the world by what we are doing! I write regularly on my blog. We have people commenting all the time. I don't really understand facebooking or what it means when somebody says they ‘like’ you but I get these sorts of messages all the time! Obviously somebody is hearing us somewhere. Well there is certainly a far reaching resonance to virtual communication. It is possible for people to gather a small sense of what you are doing from halfway across the world. This seems very important. There is a form of de-centralised connectivity in the sharing of this kind of knowledge. The question is how to change this into action. How to transform it in a material way to change things. Yes. Right now as we are in the process of relocating a lot of different groups and people have come by and taken plants but there is still quite a lot of stuff here that needs homes. You can tell anybody! Spread the word! Educate people! Plant seeds across the city!